After our trip to Kurumaya last month, the girls and I decided it was time for another get together (especially since I'm soon to be leaving my current job - cue multiple leaving lunches!). So we headed to Haz for some Turkish cuisine. Karisik kizartma - almost too pretty to eat! There are a few good set lunch menus on offer - including an impressive selection of mixed mezze for just £9.95 - but we were all in the mood for something a bit heartier. Instead we went A La Carte, with four of us ordering dishes from the Charcoal Grill menu (which come with rice and vegetables) and one from the vegetarian menu. The meal started with olives and baskets of delicious Turkish flatbread. Still very slightly warm, this was thick, doughy and incredibly good, and I ate far more than my fair share. And the main courses were equally tasty. My tavuk shisk chicken was lovely - big meaty chunks of chicken, with a spicy exterior and a fantastic chargrill flavour served alongside a portion of tasty stir-fried vegetables*. My own quibble was that the meat was very slightly dry - it could probably have benefitted from a portion of yoghurt dip or spicy tomato sauce, and if I go again, I'll make sure I order some on the side. The cevizli kasarli kofte - skewers of minced lamb with halloumi and walnuts - also went down very well, as did the kuzu shish (juicy cubes of spicy chargrilled lamb - simple but delicious). 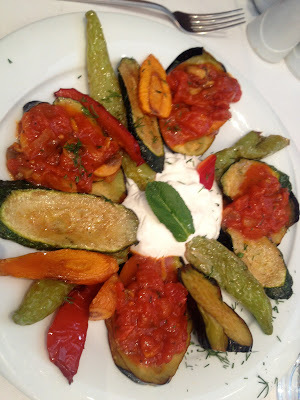 The vegetarian karisik kizartma was a particularly attractive dish: a colourful selection of fried aubergine, peppers, carrot and courgette, arranged in a sunburst around a mound of thick Turkish yoghurt and finished with a drizzle of rich tomato and onion sauce. *I asked for a double portion of veg in exchange for my rice...but I'm not sure if they forgot or if the portions are just very small!